I was confident that this baby would be early. So confident that I had packed my bags nearly two months ahead, and avoided committing to much of anything for weeks in advance – after all, I could go into labor at any moment. I had planned for every scenario, but didn’t consider for an instant that my due date would come and go without a baby. 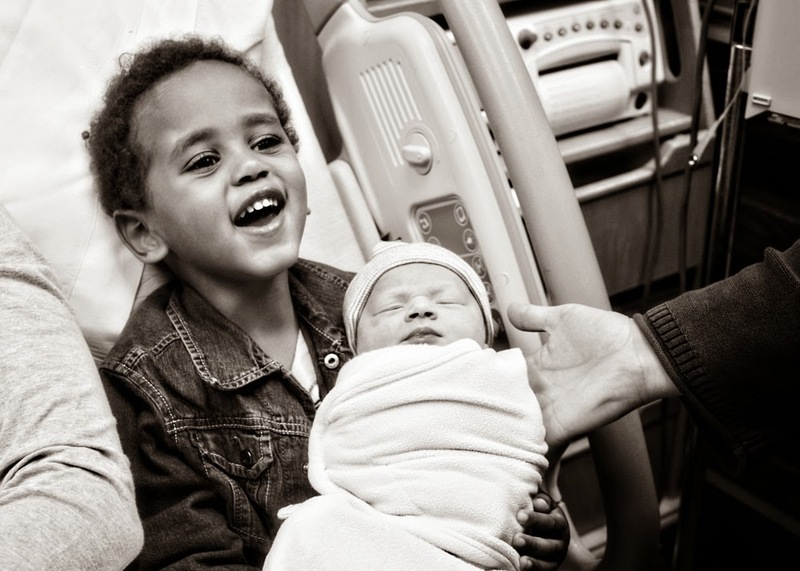 He was due on Thanksgiving, and I intended to enjoy my mama’s turkey and dressing from home – with our new little one. Thanksgiving came and went without a sign of labor. Six days later and a day of dull, irregular contractions had me convinced that it still wasn’t quite time for our little one to show up. 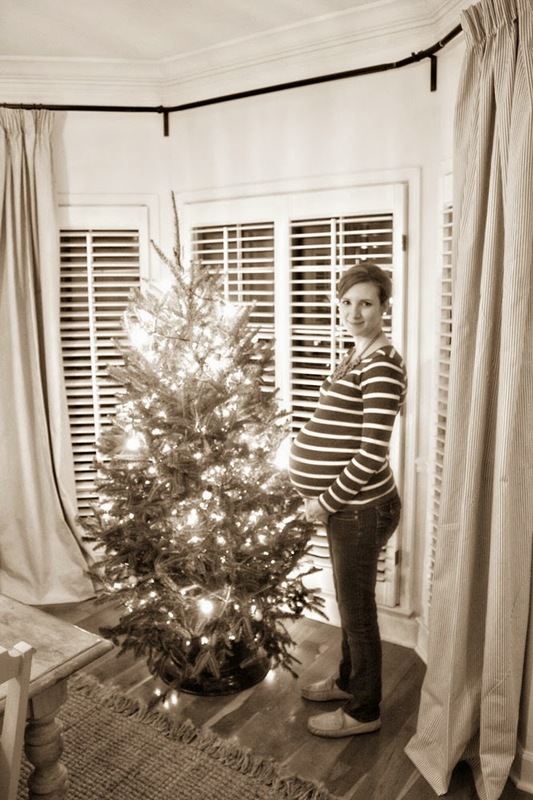 I was a little less than thrilled to still be pregnant while decorating for Christmas...and I don't think I could have gotten one bit bigger! That evening, though, my contractions started intensifying and growing closer together. By the time Keith and I tucked the kids in bed, it seemed like this might – in fact – be it. By ten o’clock, my contractions were about three minutes apart, and we had double-checked all our hospital bags and called the midwife and my mom. As soon as she arrived to stay with the kids, we headed out the door and into Atlanta. When we arrived at the hospital and finally made it inside (Who knew the front entrance would be locked after hours? Or that the next-closest door was for staff only? Or that attempting to circumnavigate a hospital while contracting is both nearly impossible and extremely painful? ), my contractions were about two minutes apart. After checking in, we were admitted to a room that was already set up for a water birth, which was what I had hoped for. The midwife checked me and somewhat apologetically informed me that I was only three centimeters dialated. She suggested that perhaps we should head home until things progressed a bit more. In between contractions I shot her a dirty look (at least in my mind), and managed to indicate that I was staying put. Period. So the nurse handed me a gown and hooked me up to a fetal heart rate monitor. Apparently they needed twenty minutes of uninterrupted monitoring, but with uncooperative equipment, I was still stuck in bed, hooked up to the monitor more than an hour later. At that point, I was checked a second time and had only progressed slightly to 4 centimeters, which was more than slightly disappointing. Very quickly, though, the contractions grew much stronger and started coming nearly on top of each other. The pain became incredibly intense, and I had very little time to recover between contractions. At this point, my hopes of a natural water birth had vanished, and I was screaming for an epidural. The nurse (I’m being kind here by leaving out any descriptors, though Keith offered several, all of which I’ve deemed inappropriate) started trying to get an IV in my arm, and failed several times. After thirty minutes of poking around in my poor bruised veins, she succeeded, but almost immediately, the needle came out as I moved around. She went right back to work, but after failing for another fifteen minutes, the midwife showed up and promptly called for another, more skilled nurse to get the job done. By now the pain was worse than anything I had ever felt or can describe. I was changing positions constantly, trying to find some relief. Keith claims (though I have no remembrance of it, nor does it sound like me :) that I roared and at one point even punched the bed. It hurt. Bad. The pain was productive, though. The midwife checked me again and I had gone from four to nine centimeters in about an hour and a half. As I gritted my teeth (or roared or whatever) through the blistering pain, the anesthesiologist was nowhere to be found. I felt livid and desperate and defeated all at once. And I wanted my epidural. Yesterday. Thankfully, the midwife was able to order some pain meds that could be delivered intravenously. Soon, even though the contractions continued to intensify and were still very close together, I was dozing between. Not even dozing, actually, but sleeping deeply. I think I even dreamed. After just a few more contractions, I somehow knew I was ready to push, and though the pain was still horrible, something shifted and I was able to focus and channel all of my energy into pushing. 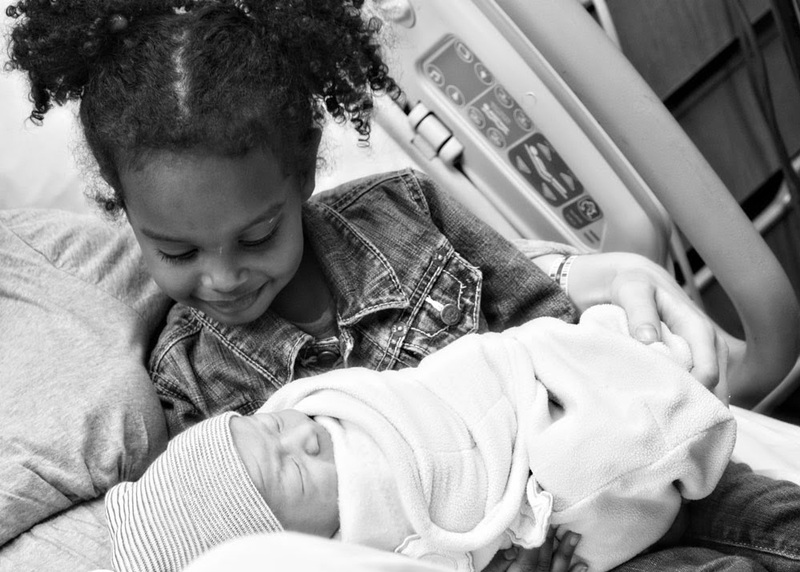 After just a minute of pushing, the midwife announced that she could see a lot of dark hair. I thought she was fibbing to encourage me, since I was certain that our baby would be bald (I was a bald baby, and I hadn’t had a bit of heartburn my whole pregnancy). After another push, though, she encouraged me to reach down and feel his head. And sure enough, he was there. I have never wanted anything as intensely as I wanted him out at that moment. And after just fifteen more minutes, he was. I was able to hold him immediately, and was completely in awe of him. In awe of his puffy newborn face, his mess of wonderful brown hair, his wrinkly skin, his existence. He was nothing like I had imagined he would be, but he was so very perfect. I am so blessed to have this amazing little man in my life. Praise God from whom all blessings flow. 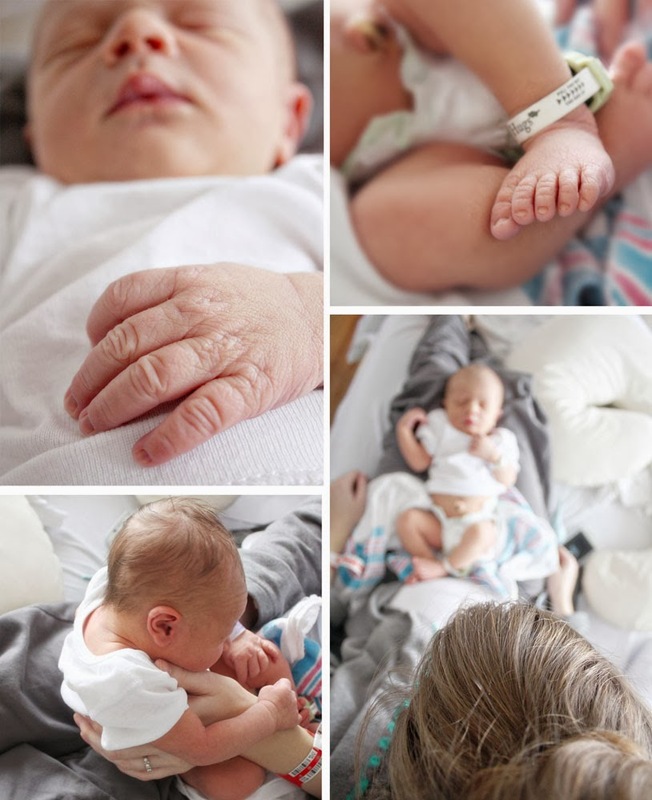 His wonderfully wrinkly newborn hands and feet, and his amazing hair. Love. Seeing Gus and Lula hold him made my joy complete.